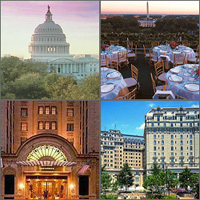 Compare discounts for Hotels in Washington, DC! Washington is the second most visited city in the United States, second only to New York, and is among the most popular travel destinations in the world. And what a tourist destination it is. Its monuments, government buildings and mansions, all symbolize that Washington DC is a Capital City and seat of the Government of a great nation. Washington is convenient for visitors though not cheap. It is dynamic; it has vibrant neighborhoods where you'll find lively nightlife, fabulous shopping and wonderful restaurants. It has a modern, clean and easy to access Metro system, more museums than you could possibly cover during the duration of a typical visit and all the other little things that make great tourist destinations great. The Hyatt Dulles is a high-rise hotel, located immediately adjacent to Washington Dulles International Airport and only 30 minutes from downtown Washington, D.C. The Hyatt Regency Reston is located in the quaint downtown setting of Reston Town Center. Town Center features more than 45 stores, 12 restaurants, an 13-screen multiplex theatre. Hotel Monaco is built on an entire city block in the style of a Roman Palazzo, complete with marble columns and facial, the 1839 Tariff Building has been meticulously restored in every detail. The Westfields Marriott Resort and Conference Center is an elegant upscale resort thirty miles west of Washington DC.